Defence wins championships! WOW, the Dal Tigers’ defence under DC Majury has been perfect on the scoreboard but I’m sure coach would say there is still room for improvement. After winning the inaugural Alumni Cup last year in the two game total point series with UNBF, the black and gold dominated this year’s series, 64-0. The Tigers’ D and special teams forced five turnovers in Saturday’s 25-0 win during the Red Bombers’ Homecoming. Connor Manson led the way with 7 tackles while Matt McKenney had 5 tackles, a fumble recovery and a punt block. Chaisson (5 tackles) again was solid in the middle. The Bombers’ opening short kickoff produced some anxiety for the Tigers as it was fumbled and recovered by the kicking team on Dal’s 34. But the unbending Tigers made short shift of the opponent’s O. UNBF’s second possession saw another scare as the black and gold D bent giving up a first down run and a long pass. But McKenney’s fumble recovery on Dal’s 7 saved the day. Dal’s D settled down and Kenzie McNeil’s 25 yard punt return ignited the Tigers’ O. Later McNeil zig-zagged 60 yards on a return but a penalty negated the major. The Tigers started on their 38 and four Hunsley passes later Darcy Chant gathered in a 30 yard TD. Brock Saumure kicked the first of 3 PATS, giving the Tigers a 7-0 lead early in the 2nd Q. On their next possession it was ditto for Dal but this was from 20 yards. Hunsley’s third TD pass was 10 to Guillaume Bernier, the black and gold’s leading receiver on the day (6-77). A Red Bombers’ safety, rounded out the scoring to 23-0 at the half. The second half was quite bland. Chippy play, penalties (a UNB disqualification) and turnovers for both teams dominated with a lot of two and outs. The Tigers’ second to last drive penetrated deep into the Bombers’ end but a lost fumble denied the march. That drive consequently saw UNBF give up a safety, making the final score 25-0. A last ditch drive by the red and black started on their 29 and was aided by two Dal URs but was terminated by a Saumure pick near his goal line. 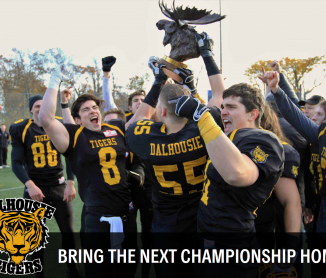 Last year’s Atlantic Football League final showed Dalhousie could play with the best. This Saturday’s game at Wickwire will see the Tigers hopefully avenge the agony of that defeat against the Holland College Hurricanes. Could this be the Year of the Tiger?